The last time I posted here about making music was around six years ago, with some of my first forays into solo soundmaking. Since then there has been just one digital EP release but a lot of furious paddling below the surface. 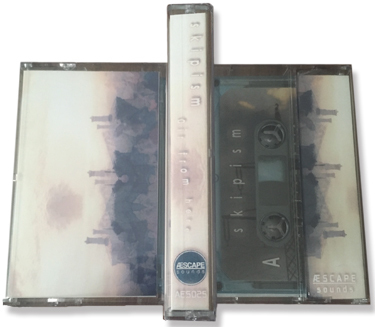 Now I’m astounded to announce my first foray into physical product, through the quite wonderful U.S. label Æscape Sounds. Air from here is described by Æscape Sounds as “five aural landscapes of morphing-industrial-ambiance,” so I guess they must be. To me they feel like slightly fizzy, sherbet-tinged wanderings that somehow coalesced into what I take to be music. My grateful thanks to the label for seeking me out via Soundcloud. I urge you to take a wander through the impressively large and diverse Æscape Sounds catalogue, and examine the beauty of their handcrafted packaging. Everything there is chosen and produced with thoughtfulness and that special kind of DIY dedication that has sustained these outer areas of music making over the last few decades. Tagged in: cassette "aescape sounds"